Krystal Villa apartment is set on prime freehold land in Sungai Nibong. It is a mere 5-minute drive from the Bayan Lepas, Industrial Area and 10 minutes away from the Penang Bridge. It is a luxurious apartment project with style and elegance. The premise consists of two 9-storey apartment blocks and has a total of 107 units. Every unit of these apartment has a built-up area of 850sq.ft. and is spacious with 3 bedrooms and 2 bathrooms. The project has only 15 units per floor and is served by 2 lifts. 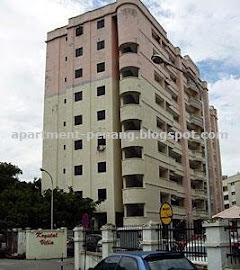 The neighbourhood apartment block of Krystal Villa is Melati Apartment. Built-up Area : approx. 850 sq.ft. 24-hours security, covered car park, landscape garden, management office, community hall, swimming pool. Can someone tell me about title at Krystal Villa? Banks don't appprove because apparently the land has no split titles yet? I hope to get advice on this. Thanks you very much! developer owe land office some document, causing all bank don't want do Krystal Villa sub sales, only cash buyer can buy now. Which bank can proceed with mortgage loan for this property? Pls advice..
Hi, do you know any banks that approve mortgage loan for Krystal Villa. Please let me know. Thanks.